Do you have a burning question on Northern Ireland international football? Please try searching the site (using the search box in the top left-hand corner) prior to posting questions. Questions will be published "as asked" so please don't include anything offensive or any personally identifiable information (such as email adresses, phone numbers etc) that you would not wish the world to see. The Editor reserves the right to delete anything inappropriate. As with everything on this site, no liability is accepted on the basis of accuracy of information supplied. I have an official photo (taken by Clemnts Lyttle Studios) of a 1934/35 NI football cap, but am struggling to identify him as only the name Albert is hand-written on the back. Any ideas? I am happy to share the photo for your archives. Hi Lindsay. There were no "Alberts" capped at senior level in 1934/35, but it is possible that it is an Amateur, Junior or Youth cap. If you could forward a photo to the address above (or post it to a photo hosting site such as Picasa/Photobucket etc and send on the link) we will have a go at identifying who it could belong to. What was Lawrie Sanchez' record as our manager, i.e. wins draws defeats and goals for and against? Sanchez's record was: Played 32, Won 11, Drew 10, Lost 11, Goals Scored 35, Conceded 42. Full details for all managers available here. Who was the last player to score against the Republic of Ireland? The last Northern Ireland vs Republic of Ireland match was held in May 1999 at Lansdowne Road, Dublin in a fundraiser in the aftermath of the Omagh Bomb. Northern Ireland won 1-0 thanks to a second-half goal by substitute "Super" Danny Griffin which can be viewed here. What is the greatest number of players from one Irish league club to start a full international match for OWC? I have 3 from Limavady starting in our glorious 11-0 defeat against Wales on 03.03.1888- can any club beat that? The Limavady tally of three has been surpassed on several occasions. Though the record stands with Linfield who supplied seven players to face Scotland on 25/03/1893. Linfield also supplied six players for another six matches. Cliftonville also managed six for four matches; the best by Distillery was five; Belfast Celtic and Glentoran's best matched Limavady with three. Bohemians, then an Irish League club, managed four against Wales in 1912. I was at the B international game against the Republic - Tolka Park - February 1998.We won 1-0. But I cannot remember who scored? Any ideas??? Has any NI player ever played top flight football in England (Premiership or old First Division)but not played for NI? For that matter, has any Welsh, Scots or RoI player ever played top flight English football but never been capped? The obvious answer is Jim Hagan (one of the few non-internationals profiled on this site) who played top-flight football with Coventry and Birmingham in the 70s and 80s. There have been many other instances, normally of just a few appearances. - just none I can think of right now! Hi there. 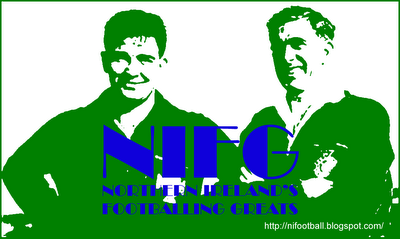 First can I say what an excellent resource Northern Ireland's Footballing Greats and Irish League Greats are... I came upon the former a few weeks ago, and must've spent hours reading it since, fabulous. This falls somewhat between the stools of both - but do you know if Belfast ever played intercity matches, against the likes of London or Glasgow or Sheffield, either as annual challenges or "one-offs"? Particularly if any such games were on the go after WWI or even WWII? Northern Ireland was fully into the annual series of inter-league, amateur, schoolboy, and junior games - and it would be interesting if Belfast got involved with this class of fixture. On the Scottish Football Historical Archive there is a single appearance of Belfast among lists of Inter-County / Representative ties... 21 Jan 1882 Ayrshire 12-0 Belfast, 28 Jan 1882 Belfast & District 0-12 Ayrshire (at Cliftonville)... but obviously that's in the formative years of the game, and something of a mis-match by the looks of it!! Glad you're enjoying the sites! Aside from the 1882 trial match (or matches) I haven't seen any evidence that Belfast played regular inter-city matches. There were regular inter-provincial matches prior to WWI (Ulster vs Leinster results here) and inter-county/inter-regional association matches (partial Co. Antrim results here, Co. Derry also played a number of matches in the late 1880s, touring Scotland and playing Co. Antrim and Dublin). Perhaps it could be surmised that as there was no Belfast FA, the Co. Antrim FA matches could be considered an alternative(?). I'll publish anything additional to the site that I find. Many thanks if you've anything on this.